Happy new year to you all, I wish you a year full of happiness and success. I am honored that I've been awarded by Microsoft for Fifth year (which can be called as a milestone) as MVP in SQL Server. I would like to thank Microsoft for their support and understanding, and for such great way to create community of technology passionate people from around the world. Last year I've been in my first MVP summit and I enjoyed it a lot, I've met many of my MVP friends there, and many Microsoft Product Group engineers and managers. I am really honored to be part of this community. 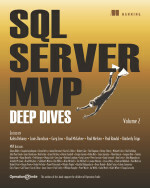 I would like to thank my MVP lead (So Young Lee), and also my SQL Family friends, other MVPs, Microsoft New Zealand, New Zealand BI user group attendees and speaker, and everyone who organized or was partly organized SQL Saturdays, SQL PASS Summit and TechEds in all conferences that I spoke, all readers of my books and blog posts. all audience of my presentations, and listeners to my video recordings. I believe my MVP award gained for my speaking engagement, and authoring activities, and all other methods of contribution within SQL community. I will definitely continue my path through SQL Server and BI as I was before to help the community with more contribution, and also to enjoy myself working with high-tech tools and engines.